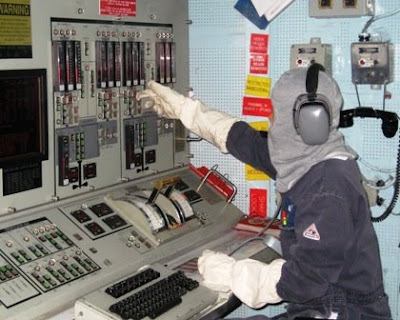 An engineer operates the propulsion plant during general quarters. The Captain cuts the cake to celebrate the ship’s 13th birthday. I really like the 'Eye Candy' posts. It's a great reminder of the work it takes to keep a warship and her people ready. Thanks, and kudos to all the RUSSELL sailors! This is a great site for parents of sailors on board the Russell. I check it out everyday. Keep up the good work it give a Dad a little in-sight on what goes on a ship while at sea. Thanks for the photo of my son. Great looking cake...my compliments to the chef!! now that's a cake, I hope there were alot of situps done after eating it. Happy Birthday USS Russell and God Bless all. Terrific looking cake! Your galley has talent. Who is the cute guy cutting the cake? That cake is awesome. Props to the cook! I bet those tread mills got a workout after that cake. Nice! BZ on rescuing that boatload of people off Somalia.